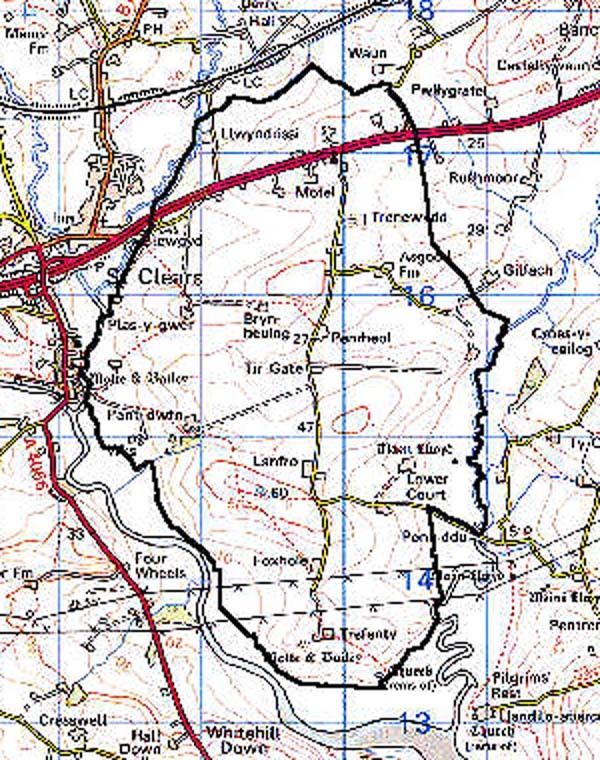 An area occupying most of the southern half of the Medieval Lordship of Osterlow (Ystlwyf) which mainly lay between the Rivers Cynin and Cywin, and which was roughly coterminous with the parish of Llanfihangel Abercowin. The caput of the lordship was at Trefenty where there is a fine motte-and-bailey castle, and the former parish church. The castle had probably been abandoned in favour of Trefenty House by the later Medieval period, but the earliest fabric of the present building is 18th century. Ystlwyf was a possession of the Anglo-Norman lords of St Clears until 1171 when it was acquired by Rhys ap Gruffydd, who granted the area to the Cistercian Abbey at Whitland in 1214, as part of the large Osterlow Grange (Williams, 1990). The remainder of the lordship became amassed within the Marshal inheritance during the earlier 13th century and was a member of the Earldom of Pembroke (Ludlow forthcoming) until the mid 16th-century, when it was acquired by the Perrot lords of Laugharne (Jones 1987, 185). It is possible that the administrative centre of the grange was at Pant-dwfn. It is likely that in common with most other granges land was let and farmed by tenants, who established the precursors of modern farms. 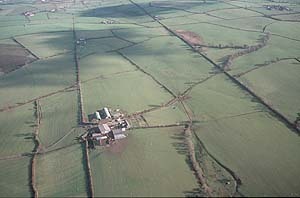 Topography in the form of ridge and furrow east of Trefenty indicates that at least some of the land was cultivated by an open- or strip-field system. However, a 15th century valuation notes that cheese and sheep/wool composed the greater part of the value of the grange, with oats providing a small proportion (Benson 1996), suggesting a degree of enclosure at this date. The parish church also lay on a putative pilgrimage route to St Davids (Hartwell Jones 1912, 372). Sir John Perrot added to his Ystlwyf holdings at the Dissolution in 1539 when he acquired the grange. His son, Thomas, married Dorothy sister of the Earl of Essex, and their daughter, Penelope, married Sir William Lowther, a well known astronomer, who died at Trefenty in 1615 (Jones 1987, 185). Benson (1996) considers Lowther's association with the estate as of the utmost importance for landscape history, as he suggests that it was he who was responsible for establishing the long straight boundaries that divide the area into large compartments, and are such a characteristic feature of the landscape. Later 17th century leases name 'the Great Division', 'Chief Line' and 'thwarte hedges' which indicate that this major compartmentalisation of the landscape had by then taken place. It is not entirely clear whether the subdivisions of the landscape are pre- or post-dated by the long straight boundaries, but it does seem that by the mid 17th-century all the present day elements of the historic landscape were in place. An alternative explanation is that the system may be much earlier in date. The division of the landscape into enclosures that average 700 metres square may be significant in that the rigid Roman land division of centuriation was laid out to a grid of square enclosures whose sides each measured 20 actus, the equivalent of 710 metres (Potter 1987, 101). Centuriation was usually, but not exclusively practised in the vicinity of coloniae in order that each veteran would receive an equal share, but it does represent a system of rapid land division that could be imposed on other unenclosed areas; however no further evidence has come to light that it was practised in Britain (Rivet 1964, 101). Trefenty Farm passed through the Drummond and Plowden families before being acquired by its present owners, the University of Wales (Jones 1987, 185). A40 which more-or-less follows the line of the late 18th century turnpike road. Earlier landscape features include three possible round barrows, two possible standing stones, and a burnt mound from the Bronze Age. The motte-and-bailey at Trefenty, a Scheduled Ancient Monument, exhibits no evidence for masonry. Other archaeological features comprise a Post-Medieval clay-pit which represents the only other economic activity in the area. Trefenty is a double-pile house mainly from the 18th century and a Grade II listed building; its outbuildings are also Grade II listed. St Michael, Llanfihangel Abercywyn, is largely medieval and also a Grade II listed building, though now ruinous. In the churchyard are scheduled Medieval memorial slabs (the so-called 'pilgrim's graves'). Farms are generally quite large holdings with stone-built, slate-roofed farmhouses that are in the main in the vernacular tradition and date mostly to the late 19th-century. Most farms possess one or two ranges of 19th century stone-built outbuildings as well as a range of modern structures. Other Post-Medieval buildings include a turnpike toll gate and former smithy on the A40, a mill on the Dewi Fawr, and a former school. The unusual field system defines this historic landscape area to a profound degree. To the south and west this area is well defined by reclaimed salt marsh.